It is a common misconception that bagworms only eat evergreens; however, the caterpillars can feed on over 130 different species of plants including a wide range of deciduous trees and shrubs. Indeed, deciduous trees and shrubs are sometimes overlooked during bagworm inspections allowing the plants to become heavily damaged and to serve as reservoirs of bagworms that can spread to neighboring trees and shrubs. A single female can produce 500 - 1000 eggs so populations can climb rapidly. Early instar bagworms can be effectively controlled using the naturally occurring biological insecticide Bacillus thuringiensis var. kurstaki (Btk) (e.g. Dipel, Thuricide, etc.). Fortunately, Btk is highly selective and will not kill predators and parasitoids important for suppressing bagworm populations. 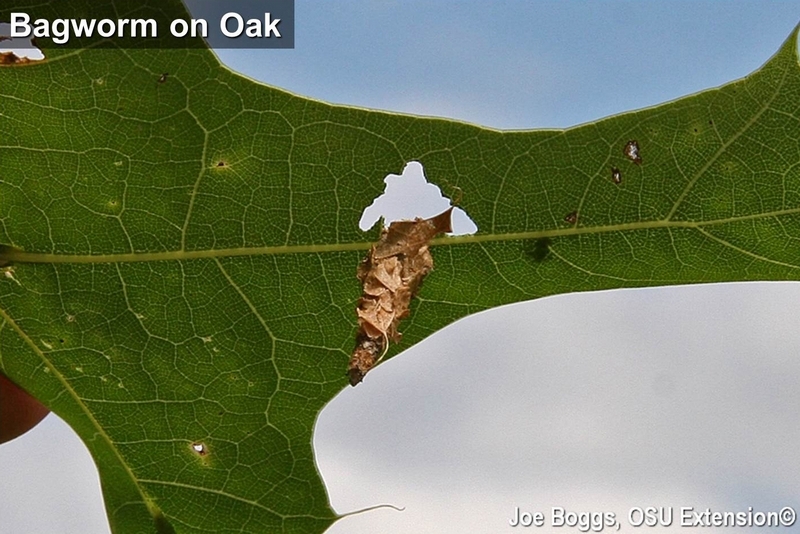 Unfortunately, Btk is most effective on small bagworms and becomes much less effective when bags surpass 3/4" in length. Once bags exceed this length, standard insecticides will need to be used to suppress heavy infestations. CAUTION: while traditional insecticides such as pyrethroids can provide effective control, they can also kill pollinators. As always, read and follow product label directions. DO NOT apply insecticides to or allow drift to fall upon plants in bloom.